Have you been to New York's oldest ice cream shop? We stopped in to try some delicious handmade ice cream and toppings. Like Katz’s Deli, Delmonico’s, and Lombardi’s, Eddie’s Sweet Shop on Metropolitan Avenue in Forest Hills is one of New York City's oldest eateries. It's also the city's oldest ice cream shop! Believe it or not, Eddie’s has been scooping homemade ice cream and toppings from behind the same marble countertops since around 1925! (Though other folks might claim otherwise: A publication innacurately reported that it opened in 1909, and the news spread quickly). After the original Jahn’s franchise locations closed, Eddie’s unofficially became the oldest ice cream shop in New York City, but owner Vito Citrano won’t own up to the superlative and does not advertise it anywhere. 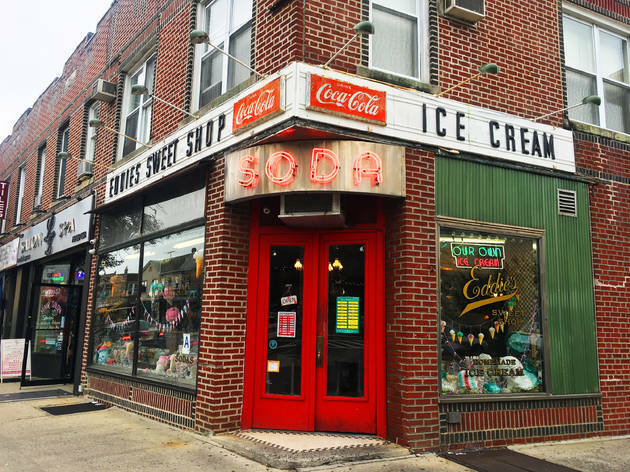 When you walk into the unassuming corner store, the first thing you might notice is that Eddie’s does not look like the typical retro ice cream parlor. Other soda fountains might have 1950s decor with chrome counters and bright red booths, but Eddie’s wooden and marble interior has not changed since it opened. Even the refrigerator is more than 80 years old. “When we bought this shop in 1968, it was already nostalgic,” Citrano said. The Citrano family and their team of scoopers make all 18 flavors of ice cream from scratch, using the same recipes that Giuseppe, Vito’s father, inherited (and perfected) from the shop’s previous owners. The menu doesn’t list any trendy ice cream flavors, so don’t even think about asking. 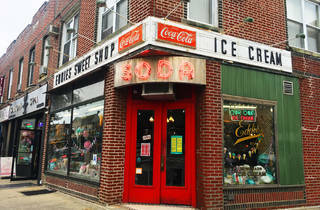 The classic ice cream shop is particularly known for its towering classic sundaes with "the works" (hot fudge, homemade whipped cream and a cherry). While chocolate is one of the most popular selections, you can also order flavors like vanilla chip, coffee, maple walnut, vanilla, and vanilla fudge. Citrano also claims that Eddie's has a secret menu, but he would not say anything further about it: 'How is it a secret menu if everyone knows about it? Visit Eddie’s on 105-29 Metropolitan Avenue at 72nd Road in Forest Hills, Queens. Want even more? Visit our favorite candy stores in NYC and order from our favorite cookie delivery services too.